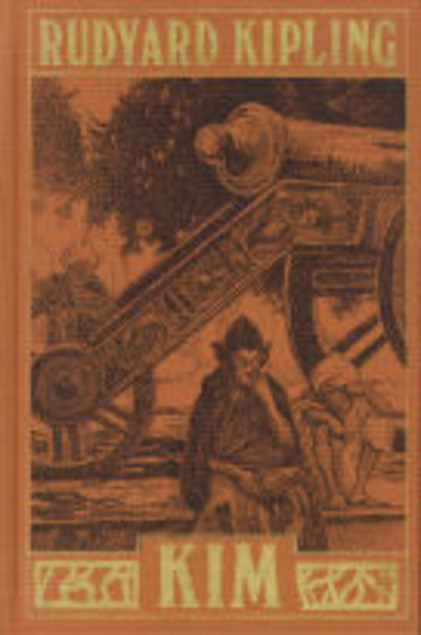 Chronicles of Carlingford by the very prolific Scottish author Mrs Oliphant is a Virago publication which consists of two novellas – The Rector and The Doctor’s Family, originally published in 1863. There’s an introduction by Penelope Fitzgerald. The blurb on the back of this book compares Margaret Oliphant with Jane Austen, George Eliot and Anthony Trollope’s Barsetshire Chronicles. I would include Mrs Gaskell too. 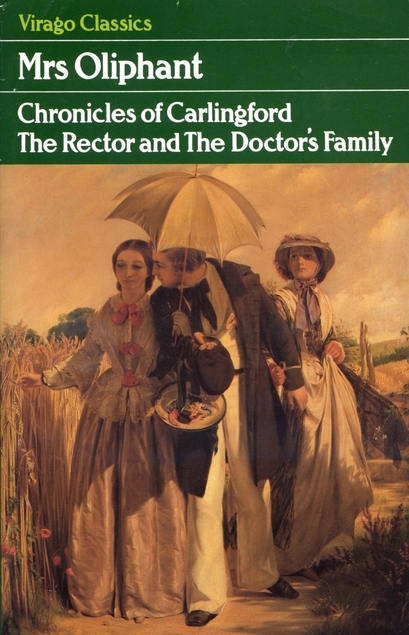 The Rector is only 35 pages long, the setting is mid 19th century Carlingford which is a small town close to London. A new rector/minister is coming to the town and his parishioners are anticipating what sort of preacher he will be. Surely he won’t be as low church as the last rector. He had gone to the canal and preached to the bargemen there – that didn’t go down at all well with his snooty congregation. Most of them are hoping for something a bit more stylish – and preferrably a bachelor as there are several unmarried ladies apparently in need of a husband. The new rector has spent the last 15 years cloistered in All Souls and this is his first living. He may be a great theologian but he’s absolutely at sea when it comes to human nature and dealing with his parishioners. Difficult or awkward men seem to have been Oliphant’s forte. There’s no doubt she had plenty of experience of them within her own family, and in fact she came to believe that her managing and competent character contributed to the weakness in her menfolk. The Doctor’s Family is 157 pages long. Young Doctor Rider has just moved to a newly built part of Carlingford, he doesn’t know it but that is not going to do his business any good. The old established Carlingfordians look down on that area. His older brother had gone to Australia under some sort of cloud and he had married and had a family out there. Things didn’t go any better for him in Australia – well – he is a drunkard – so he had come home and was living at his young brother’s expense. Dr Rider had decided that although he wanted to marry a young woman he couldn’t afford to look after his brother and a wife and children, so he had given up hope of marrying at all. Imagine his horror when his brother’s wife and children and her sister turn up and billet themselves on him! Even worse – it turns out that his brother’s wife is feckless and doesn’t even take any notice of their badly behaved children, and for some reason she blames her brother-in-law for the situation that she and her husband are in. This one is much stronger I think, but they’re both well worth reading and have moments of comedy as well as frustration at enraging characters. 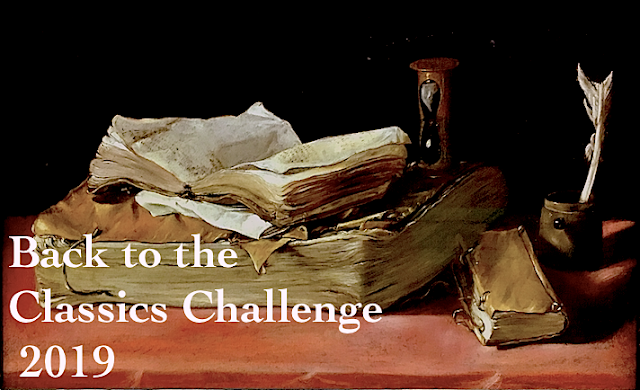 I’ve decided to participate in Karen @Books and Chocolate’s Back to the Classics Challenge 2019, it seems like a good idea as it’ll be a way of concentrating on unread books that I already have in the house. There are twelve categories – see below – and I intend to read one from each category, just for a wee bit of fun – I know, it takes all sorts! See my reading choices below the categories. 5. Classic Comic Novel. Any comedy, satire, or humorous work. Humor is very subjective, so if you think Crime and Punishment is hilarious, go ahead and use it, but if it’s a work that’s traditionally not considered humorous, please tell us why in your post. Some classic comic novels: Cold Comfort Farm; Three Men in a Boat; Lucky Jim; and the works of P. G. Wodehouse. 11. Classic From a Place You’ve Lived. Read locally! Any classic set in a city, county, state or country in which you’ve lived, or by a local author. Choices for me include Giant by Edna Ferber (Texas); Sister Carrie by Theodore Dreiser (Chicago); and Buddenbrooks by Thomas Mann (Germany). Have you read any of these ones? It isn’t too late to join in with this challenge – go on, I dare you! I’ve been away in Lancashire over the last four days, and I had scheduled some posts to go on here while I was away – but only one of them did go on – technology – huh! Anyway that’s why I didn’t post about this classics spin before it was actually announced, but I’m just going ahead with it anyway. The number has been picked and it’s 1 so I’ll be reading The Earth by Emile Zola. I’m quite looking forward to reading it. Yes it’s spin time again at The Classics Club. Post a list of twenty classics from your list and read whichever book the spin comes up with. I’m really not fussed which book I get to read. There’s plenty of time to get around to reading it as the 31st January 2019 is the big day to post my thoughts on the book. Quite a lot of the books on my list are chunksters. It’s spin time again at the Classics Club and the number will be chosen on Wednesday the 1st of August, I’ll have to read it by the 31st of August. I’ve fairly recently had to compile my second classics list as I completed the original one a while ago, so here are twenty from the newish list, I don’t mind which number comes up. Well the Classics Club Spin number has been chosen, it’s number 3 so the book that I’ll have to read before April 30th is Sir Walter Scott’s Bride of Lammermoor. That’s fine by me as I’ve been meaning to read that one for ages. My copy which was published by Richard Edward King Limited originally belonged to Jack’s grandfather so it’s very old, but strangely it has no publication date on the front. The print is very small so although it’s only 316 pages long that probably translates to over 600 pages in a more modern print size. I think I’ll download it from Project Gutenberg so I can read it on my Kindle, or get a more modern copy. Did you take part in the spin, and are you pleased with what you have to read? * On Friday 9th March the Classics Club will announce a number. Yes it’s Classics Club Spin time again. Just a bit of fun and the bonus for me is I don’t have to decide which book to read next. So I’m listing 20 books from my Classics Club list. April the 30th seems a long way away to me, but no doubt it’ll gallop up on us. The spin number will be announced on March the 9th. I’m not terribly fussed which number I get but as I’ve recently read Anna Karenina and at the moment I’m reading Pawn in Frankincense, both of which are hefty volumes, I’d rather avoid a chunkster. I’ve just realised though that there are quite a few thick books on my list. Redgauntlet by Sir Walter Scott was first published in 1824. I’ve wanted to read this one for ages, but I can’t say that it is one of my favourites. Scott is of course very wordy, and I usually get used to that very quickly, but this one seemed like an awful long road to reach what the author wanted to say which was that the Jacobite cause was well and truly over and the Hanoverian King George sitting in London had no need to fear any other Jacobite rebellions. Scott was actually very much involved with the British royal family, he masterminded George IV’s visit to Edinburgh in 1822 and even designed the clothes that he wore for it. Yes we have Scott to blame for all that tartanry and fol-de-rol lace and velvet, although thankfully nobody has been keen to emulate that king completely as George IV insisted on wearing pink tights with his kilt! 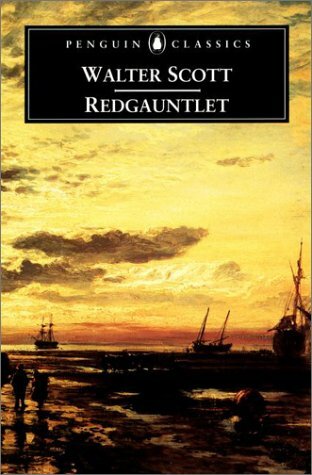 Anyway, back to the book – young Darsie Latimer is a bit of a harum scarum and while on an adventure on the Solway Firth close to the English border he ends up getting kidnapped by Redgauntlet. His good friend Alan Fairford hears about this and decides to ride to his aid, despite the fact that he is in the middle of his first court case as a lawyer. Darsie had no idea who his parents were but it turns out that the Border laird Redgauntlet himself is related to Darsie and Redgauntlet has been busy trying to gather together some people that he thinks might be interested in taking part in another Jacobite rebellion. He tells Darsie exactly who he is, and that his father had been executed for his involvement in the 1745 rebellion. Darsie isn’t interested in joining the cause, not even when he knows that Charles Edward Stewart is there. There’s a bit of romance in there as you would expect, and a man dressed up as a woman to avoid detection, a standard Jacobite rouse! My favourite Scott novel is still The Pirate. Claudius the God by Robert Graves was first published in 1934 and is of course the sequel to I,Claudius. You can read what I thought about that one here. I think inevitably Claudius the God wasn’t as gripping a read as I, Claudius probably because that one featured so many power crazy emperors, executions, murders and poisonings were constants so it was all go. The story is of course being told by Claudius and when he reluctantly dons the purple robes of emperor (he wanted to bring back the Roman republic) he tries to put the country on an even keel by melting down all the gold statues that Caligula had had made when he was completely mad. Claudius is very popular amongst soldiers and ordinary people, but the senators aren’t so keen on him and a few of them had already tried to grab power before the army declared him emperor. This book is Claudius’ account of what he did and why he did it. In some cases he behaved just as badly as previous emperors although he acknowledged his mistakes, the end result was still miscarriages of justice. The worst mistake he made though was to trust his wife Messalina. Despite the fact that he had seen how his grandmother Livia had abused the power given to her by her husband Emperor Augustus, Claudius gave Messalina just as much power as he had, giving her a duplicate of his seal so she could and did do whatever she wanted. As she was just as evil as Livia, she caused mayhem but poor Claudius had no idea of her real character at all. Herod Agrippa features quite a lot and of course it was Claudius who invaded Britain so that is very interesting although I have no idea how true that account is. Did they use elephants and camels in the invasion terrifying the British who had never seen such animals before? It seems that Claudius was wise in many ways, or maybe it was just that he was well read and ‘stood on the shoulders of giants’. But in many ways he was completely naive. This book was one of my 20 Books of Summer and also counts towards my James Tait Black Memorial Prize Challenge as it won that prize in 1934. I was in a St Andrews bookshop a few months ago when an American chap was buying an ancient set of Rudyard Kipling books and praising Kipling ‘to the skies’. Well, I had only read the Just So Stories, Puck of Pook’s Hill and Rewards and Fairies – way back in nineteen canteen – as my mother used to say for some reason. So I thought that maybe I was missing something and it was about time I got into Kipling, I have a lovely Folio Books copy of Kim so when I realised that Kafka’s The Castle was not going to be good bedtime reading I decided to givew Kim a go. Unfortunately I soon discovered that Kim and the Castle actually have quite a lot in common. They’re both basically about a quest. Kim is a young orphaned boy. His father was an Irishman in the British Army and his mother was also white so despite the fact that he has been living as an Indian and speaks English with an Indian lilt, he is in fact a ‘sahib’. He forms a relationship with a wandering holy man from Nepal who is searching for a special river. Kim becomes the holy man’s disciple and helps him with begging for food as they continue on their travels. But Kim is also looking for something, he had a vision of a red bull and knows that it has a special meaning for him, so he is searching for it. When he finds the red bull on a flag flying in a British Army camp he discovers that his father had been an Irish soldier and when the officers realise that Kim has been living as a native they decide that he must go to school to be trained up possibly as a surveyor. After three years at school during which time the lama travels around on his own, eventually the two are able to continue their travels again. I read on to the end but I can’t say that I found Kim to be an entertaining or even informative read, but as always when I read a disappointing classic I’m quite glad that I did read it and now know what it’s about. I read this for the Classics Club Challenge. Well the Classics Club spin number is 15 so that means that I have to read Franz Kafka’s The Castle for August 1st. I must admit that I had a sharp intake of breath when I realised which book I would be reading. I turned to Jack and said – I’ve got to read The Castle – and he gave me a big manic grin and said lucky you.